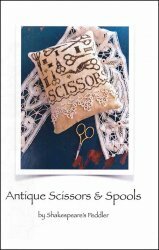 Antique Scissors & Spools [C5421] - $7.00 : Yarn Tree, Your wholesale source for cross stitch supplies. Cross stitch pattern by Shakespeare's Peddler. If you like to sew or stitch, you know you can't have too many pairs of scissors or spools of thread! "Antique Scissors & Spools," features antique scissors & spools stitched throughout. This design is a must have for that person that loves to sew and/or stitch! Stitch count is 80 x 90.